Yours. Daydream View is designed with choice in mind. The headset fits phones big or small, so it’ll work with any Daydream-ready phone you choose. And just like your clothes, the headset comes in different colors — Slate, Snow and Crimson — so you can choose the color that matches your style. Enjoy the best of Google. We’ve brought some of the most popular Google apps into VR. With YouTube , you can watch the entire library of videos on a virtual big screen and experience hundreds of thousands of immersive videos from creators like Buzzfeed, PrankvsPrank, Meredith Foster, CollegeHumor, Tastemade, UnboxTherapy and VSauce2. Use Google Street View to see curated tours of more than 150 of the world’s most amazing places like the Pyramids and the Taj Mahal, or just search to explore everywhere else. Google Play Movies makes tens of thousands of movies and TV episodes available in your own virtual theater. And Google Photos displays your 360° captures in a whole new way. Australia: Telstra, JB Hi-Fi; $119 (AUD) In the U.S., Daydream View will be available for pre-order starting October 20 at Verizon and the Google Store. Slate will be available in all countries at launch, and Snow and Crimson will be coming to the U.S., U.K. and Australia after. 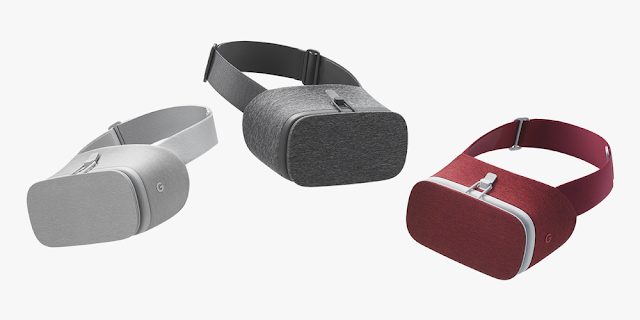 Sign up on the Google Store to get notified when Daydream View becomes available.